I ordered this wallet to match with my new addition to my purse collection. I am very pleased this item as the true red color is magnificent and the leather is smooth. I love it especially for the coin slot for easy reach when you needed. I would recommend this for everyone and for the small purses. Pockets/Slots/I.D. Window: Pockets/Slots/I.D. Window: One bill compartment divider in snap on coin purse, hand-aligned credit card slots. This wallet is exactly what I was needing. It has plenty of space for the various cards I carry and storage pockets along the side where I keep my insurance cards. Business cards would be perfect for those areas as well. The outside has a coin pocket that secures tightly with a metal closure. In addition, the side offers two deep pockets for paper money and receipts. The color of the leather is as pictured. Time will tell to see how well it holds up. It appears to be well designed and made, so I’m hopeful to get many years of use out of it. I am seriously thinking I should order another one to put away until this one needs replacing. 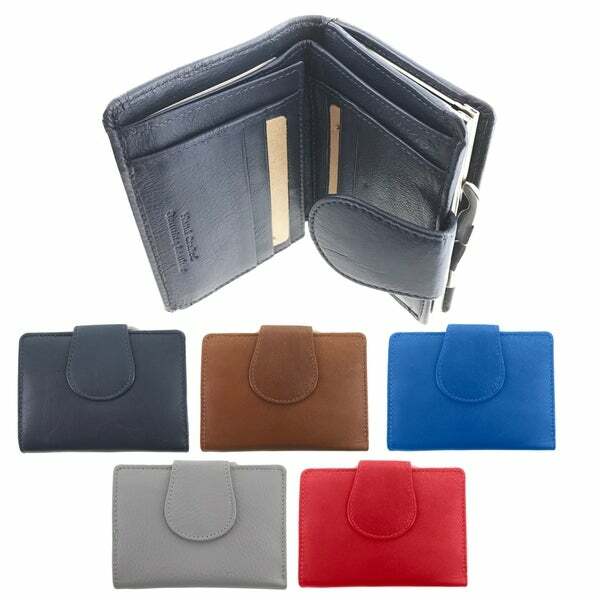 I have been searching for the right wallet for some time and now that I have found it, I will save myself some trouble in the future having it already on hand to use.